Saint Jude school is a VPK provider and supporter of Step Up For Students Vouchers. We have success! Blooming in Progress! 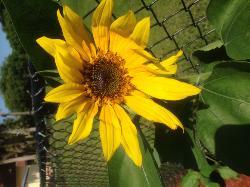 After several weeks of tending to 350 planted sunflower seeds, we have success. There was tremendous excitement on campus Wednesday when a several students noticed a few bright yellow pedals against the fence.